Food is important. As fleshy carbon-based lifeforms, we need it in order to live and do stuff. But sometimes you just don’t have the time for a complete meal. Sometimes you just wish for those much-needed calories and macros to somehow magically or scientifically teleport into your gut so you can focus on your work. Well, we can’t top that but let’s see if we can at least come close. Here we will examine a few interesting healthy office snacks that are convenient to have at the workplace. The Soylent drink is advertised not just a meal replacement but also as “staple meal”. And the reason for this is because technically this sci-fi-looking concoction contains everything the human body needs. It has soy protein (which has a complete amino-acid profile), fats, carbohydrates, fiber, vitamins and minerals. And water, of course. Which reminds me that it also comes in a powdered form you can use to prepare your own drinks and smoothies. While Soylent is definitely not the most appetizing snack on this list (unless you try the flavored varieties), it definitely beats everything else in terms of efficiency. You can just pop a bottle open and gulp it down in less than 30 seconds. A single bottle is 400 kcal which makes calorie tracking easy. Basically, there is a rich variety of plant milk which is also a quick way to get some calories when you are in a hurry. The most popular are soy, almond, rice and coconut but there are also drinks from oat, hemp, hazelnut and cashew. Almond and cashew milk are particularly delicious and are a wonderful creamy base for all kinds of shakes and smoothies so you should consider them for your office snack ideas. However, don’t shy away from gulping them down directly from the carton or bottle. On the other hand, If you are looking for alternatives to dairy, soy milk is a great start because it goes great with coffee, cocoa, cereal and oatmeal. Just make sure to read the ingredients list because sometimes these products have added sugar. They tend to be low-calorie which is great if you are trying to lose weight but might be nutritionally inadequate for the regular gymgoer. Oh, look, a segway to the next item on the list. So, the main protein ingredient in Soylent is, you guessed it, soy protein. But did you know that there’s are other plant-based protein powders out there? In particular, rice protein and pea protein make quite an interesting combination that has a pretty good amino-acid profile. Basically, all 9 essential amino acids are present. Other plant protein powders include hemp, chia, and almond. Surely I am missing some. They are not all that delicious on their own but contribute with interesting textures to shakes and smoothies. One of the easiest ways to get some protein in your system is to put a spoon or two in a glass of some plant-based milk. For instance, rice milk is naturally sweet without any added sugar and it nicely negates the bitterness of your chosen protein powder. It might be a bit hard to supply yourself with fresh granola bars. Explore the area around your workplace for hipster coffee shops, bakeries and bio-markets or whatever they are called nowadays. These are the places where you are likely to find freshly made granola bars with actual dry fruits, without added sugars and oils. 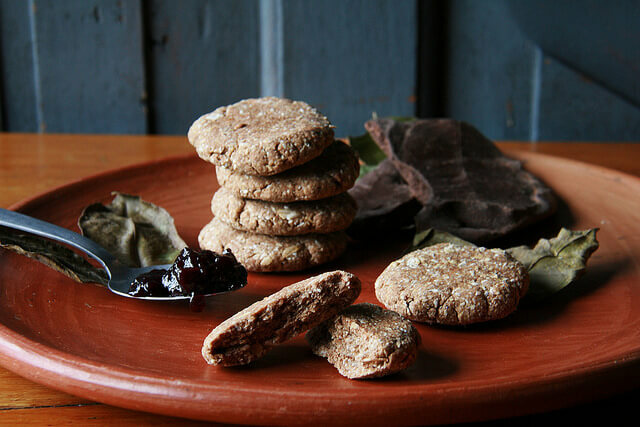 If granola bars is not your thing then surely you will stumble upon some freshly made oat cookies. The usual ingredients аре oats, wheat flour and banana but you might stumble upon a variety with cocoa, dates, honey, and various nuts and seeds. Oats are packed with minerals, protein and fiber, and are a great source of carbs. Freshly roasted nuts with salt are a mouthwatering snack. The smell of golden almonds from the oven is enchanting. Cashews are no less mesmerizing either even though they are technically not a nut. Peanuts, hazelnuts, macadamia, walnuts, it’s a pick your poison situation as pretty much all of them are healthy food to take to work. Nuts are very satisfying and satiating, packed with nutritional goodies and healthy fats. However, they are pretty calorie dense so you have to be careful. It’s pretty easy to crunch 100 grams of your favorite nut but that would be over 500 calories for sure. Okay, they might be bland but their texture is not all that bad. And they have a simple ingredients list of water, rice and salt. Some office folks have been using them as a replacement base for other ingredients such as cream cheese and hummus. Who knows, you might find them fascinating. Especially, if you are a domesticated rodent. Next Post Can Office Workers Stay in Shape?